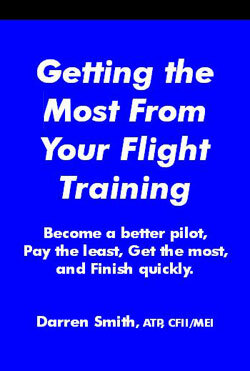 There are folks out there in our system that provides the "easy road" to pilot certification. The guilty parties include flight instructors, examiners, as well as the pilot-student themselves. We all know the Santa Claus examiner in the local area which will be an easy pass for our student. While we can't control how a DPE will administer a flight test, we can control the quality and thoroughness of our flight training. Darren- What is your understanding of the liability of a CFI who signs off a BFR? Is he on the hook for any mishap of the pilot for the next 24 months? What kind of liability insurance would cover this? Darren's Response: Oh yeah... case law is not on the side of the CFI. The cases I'm aware of were related to the death of the pilot and the widow going after everyone involved. AOPA/NAFI both have CFI insurance with NAFI slightly better. The FAA is starting to look closer at CFIs who are involved with pilots who are troublesome. About 5 years ago, I got a call from the local FSDO regarding a pilot who was not multi-qualified but was out flying his personal twin around and smashed it into a runway gear up. I discontinued lessons with him because he wouldn't buy a checklist for his aircraft. When the FAA called, they didn't tell me the purpose of their enquiry until I told them this little detail. Suddenly they weren't so interested in me anymore. They pulled the pilot's license forever, something about endangering the public. I clearly came out on the good side of that one. But what if it went the other way? Anyway, buy the insurance, its good piece of mind. You never know when a widow is going to come looking for you. Always document clearly what you did on the lesson in the pilot's logbook... even if it takes 2 lines. There's no crime in that, and it will protect you in the long run. Thanks for your email, hope that helps.